After 2015, there will be no more nuclear icebreaker trips to the North Pole so passengers are urged to book now or miss the boat as northern polar trips begin to concentrate instead on the Northwest Passage across the top of Canada and the Northern Sea Route above Russia. 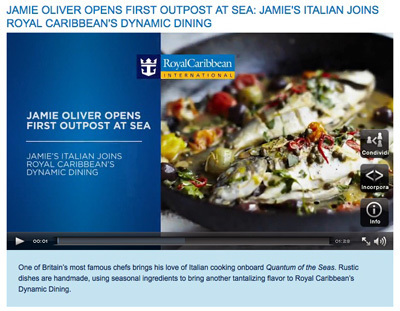 Elsewhere, Royal Caribbean International scored a coup last week by engaging British celebrity chef Jamie Oliver to install the first “Jamie’s Italian” restaurants at sea on board the first two “Quantum” class ships, debuting this year and next. Finally, in view of last week’s Guinness Book of World Records christening of eighteen Viking Cruises river cruisers in a single week, we remember the introduction into the English language of the “Hagenism,” named for Viking CEO Torstein Hagen, by the US edition of Travel Weekly a year ago. A nuclear icebreaker, the Arktika, was the first surface ship to reach the North Pole, in 1977 (submarines had been there before), and in 1989 the first tourists were taken there, again by nuclear icebreaker. However, after more than a quarter century of this diversion being available each summer for the curious and the wealthy (fares start at £15,965), this opportunity will come to an end in 2015. Hence the announcement last week by Quark Expeditions that the Russian icebreaker 50 Years of Victory will be withdrawn as an expedition vessel next year. The Victory replaced an earlier nuclear icebreaker, the Yamal, five years ago. The end of this era will be marked by Quark offering three final voyages to the North Pole in June 2015. One of this year’s two departures is sold out but there is still space on June 30, 2014, as well. Quark is the first and only North American operator to offer trips to the North Pole aboard 50 Years of Victory. Such voyages have also been offered by Poseidon Expeditions of Moscow since 1999. Only 128 people will have the opportunity to join each of the three final Quark voyages. The company has been offering expeditions aboard 50 Years of Victory since 2009, and has taken over 1150 passengers to 90o North. After the 2015 season, Quark will have taken almost 1800 passengers from all over world to the North Pole. To meet demand for the final year, Quark has added a third voyage. Departing on June 3, this early voyage will be 15 days in length, one day longer given the heavy ice conditions, up to 10 feet thick, that Victory will crush through this early in the season. The other two departures, June 15 and June 26, will be 14 days. Quark is the only tour operator to offer hot air ballooning at the top of the world. Other tours have been offered in the past by helicopter and by submersible to the bottom of the ocean. There will be a total of six departures next year, a record for the North Pole, as Poseidon Expeditions will offer three later departures in 2015, on July 14, July 25 and the very final voyage on August 5. Per person rates start at $24,995 for the 2014 season, and $25,995 for the final season. On July 30, 2013 participants in a Poseidon Expeditions North Pole cruise reached 90o North in the 100th arrival at the North Pole in the history of icebreaker navigation. 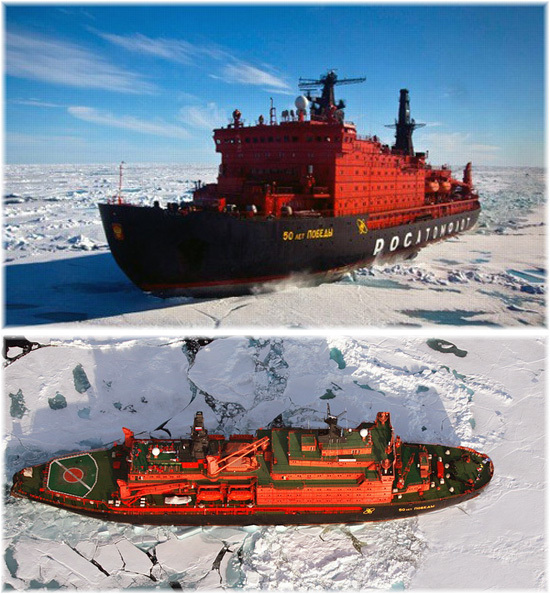 The icebreakers are chartered from the Murmansk Shipping Company of Murmansk. “Another first for Britain’s best loved chef” probably says it but it appears that Royal Caribbean International have outscooped P&O Cruises on the chef side in one fell swoop. P&O have appointed four celebrity chefs and a wine specialist in Olly Smith. BBC-TV food presenter James Martin was named as the latest P&O guest chef last month, responsible for setting up P&O’s new Cookery Club on board the new 3,600-berth flagship Britannia, set to debut in the spring of 2015. Last week, “Jamie’s Italian” and Royal Caribbean announced that it would be opening the first Jamie Oliver eateries at sea on the 4,180-berth Quantum of the Seas, debuting this autumn from New York, and sister ship Anthem of the Seas, which will be based in Southampton from the spring of 2015. The addition of Jamie’s Italian, which features rustic dishes using recipes that Jamie Oliver loves, will be part of Royal Caribbean’s suite of eighteen restaurants on board the Quantum class, which will have no main dining room. “I’m thrilled to partner with Royal Caribbean, a brand that continually pushes the limits of what’s possible, to debut my very first restaurants at sea onboard the new Quantum-class ships,” said Jamie Oliver. “Royal Caribbean shares my approach to food and dining, which is to serve simple, fresh ingredients in a warm, inviting ambience”. It’s interesting that a British chef is introducing these Italian eateries but while the Anthem will be making the occasional call on Italian ports on her cruises from Southampton, neither ship will be sailing from Italy. Since opening in Oxford in 2008, “Jamie’s Italian” has become one of the biggest restaurant success stories in Britain, now numbering thirty-seven outlets in the UK and eight more in overseas countries. The casual dining experience is based on offering tasty and simple Italian food, using only the best fresh ingredients.